Guided one of my favorite clients, Redfish University alumni and VIP, Bob Willice this morning. Bob wanted to do a little of everything this morning. 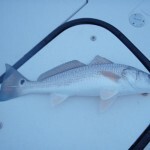 Find some big trout, learn the bay grouper fishing and then I was going to show him some awesome areas to sight fishing bull redfish on the fly when they are nowhere to be found and not on the surface. I was a bit concerned last night with the hard north wind but thought we’d be okay as long as there wasn’t any east in the wind. 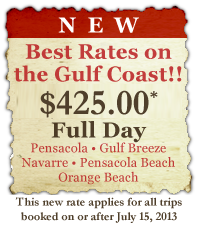 The grouper fishing gets a little tricky in a flats boat over at Ft. Pickens when the bay chop originates from the north or northeast. 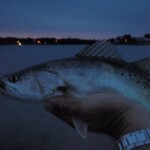 Met Bob at 545am and started at first light in Bayou Texar for some big trout. 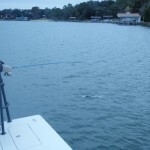 Bayou Texar is a pretty big area but it’s important to find dropoffs, deeper water and bait. About 15 minutes into our fishing, we both realized that the bay was going to be a little challenging with the building winds and I asked Bob if he wanted to reschedule on a better day late next week. He agreed. I figured since I got him up early and he drove all the way from Tiger Point, I’d show him some fantastic techniques for catching big speckled trout, redfish and flounder in our local bayous. 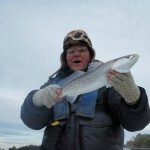 Plus, Bob is an avid fly angler and would not doubt appreciate learning some extremely productive, protected and very consistent areas to throw a fly during the winter. We messed around and both fished for an hour and a half. Not a bad little trip with over 20 trout(some reaching 3.5#), 6 redfish(15-24″) and 3 flounder(13-15″). All fish released. 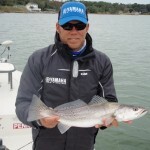 I let Bob in on a super trick to get these difficult speckled trout to bite. Using a Gulp! 5″ Jerkshad in camo or rootbeer with a 3/8oz. Marsh Works jighead, we make long casts and let the bait settle. 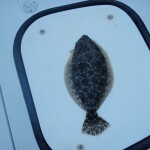 Sometimes just the commotion on the bait hitting water will trigger a bite once the bait comes to rest. A slow tap-tap retrieve with a 3-4 second deadstick is my normal cold water retrieve. If a strike isn’t produced in the first 20 feet, I will jump the bait 3-4 feet off the bottom quickly and then let it settle to the bottom. After a 3-4 deadstick, I usually feel resistance and set the hook. If the fish isn’t there, scoot the bait, watch your line and feel for the thump. This technique work for us all morning and all other retrieves produced zero. The fish are there, following the bait and waiting for it to stop. The big jump is only used to get their attention. Point being, 90% of our strikes came on a deadstick bait and I’m positive the Gulp! scent helps! Just a helpful hint! 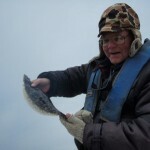 Anyway, I’ll see Bob next week for some grouper and big redfish action.